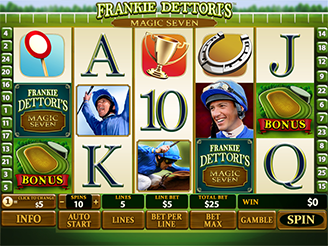 Ride with one of the most prolific jockeys in horse racing when you play Frankie Dettori's Magic Seven online slot game at MansionCasino.com. Dettori entered horse racing lore when he rode seven horses to victory at the Ascot on one magical day in 1997. The online slot game does its best to bring that magical feeling right into your living room when you download our online casino software and play the 25 payline slot game. There are plenty of ways to win real money with a free spin feature, bonus round and 7,777x jackpot. Frankie himself is on two of the symbols and the wild symbol. In addition to substituting for any symbol needed to create a win, the big jackpot can be won when there are 5 wilds on the reels. There are two bonus features that can bring you good fortune should the reel align in your favour. The Free Games Race is activated when there are three Magic 7 symbols located anywhere on the reels. You can jockey one of the three horses on the screen and depending on how it fares in the race, will determine the number of free spins you can play. The first-place horse comes with 35 free spins, second place has 15 and third place will give you just 10 free games. The second feature is activated when the bonus symbol appears on both the first and fifth reels on a single spin. This feature is a pick-and-click feature that takes place on the racetrack. The track is divided into 20 sections, with a prize hiding in each section. Simply start clicking on the track to see what you've won. The feature will end when you uncover the piece of the track that says "Collect". You will collect all your winnings and return to the reels. Do you think you could be a jockey and win a race? It doesn't matter because you don't need any horse racing skills to win real money at the internet casino. All you need to do is open an account and make a deposit and start spinning the reels. You will also receive a Welcome Bonus of up to $/€5,000 after that first deposit that can be used when playing all your favourite online casino games.